Like me, I’m sure you had a serious case of the Sunday Scaries yesterday and were dreading the arrival of Monday. My fourth of July weekend was exactly what I wanted and expected it to be: lots of time on the lake and by the pool, delicious food (think fresh salads, juicy burgers and a touch of BBQ) and hanging out with my family. I also had a brief hiatus from lounging to attend my friend Kelly‘s wedding on Saturday night! Kelly is the designer of Kelly Wynne handbags, remember? The bride looked beautiful and it was so much fun catching up with old friends from way back when! Now that the holiday is over, I’m looking forward to my birthday this coming Friday! To celebrate my turning 27, I’m heading to the luxurious Lake Austin Spa Resort for a few days to relax and unwind. I’ll be posting all about the resort on my Instagram today and tomorrow, so stay tuned for an inside look at their gorgeous grounds, refreshing treatments, fun fitness classes and more. One thing I’ll definitely be taking with my are my favorite Jack Rogers sandals (now on sale!) – they’re super comfortable and scream summer, don’t you think? I wear them everywhere – from errands to days at the pool, these sandals are easy, simple and go with everything. I’ll also be taking my new Tory Burch caftan and fedora (love the white grosgrain ribbon). Click here to follow along on my Lake Austin Spa Resort adventures! I am in love with that skirt, these colors look so good on you. Well, I just adore your Jacks! I don’t think I’m ready for this Monday either. Can I just stay in bed and forget work? You look lovely! I had the Sunday Scaries also. That sounds like an amazing weekend! I really like this outfit, as orange looks great on you! Have a great time on your trip! You look so beautiful wearing orange! Orange is absolutely stunning on you! Spa weekend for your birthday sounds amazing! Mine is in a little over a month and I think I’ll be taking a page out of your book. I also love this skirt and your bag! Such a great summer look. Love that top & those bracelets!! Ah this is such an adorable look and loving all the accessories with it! Those sunnies are amazing with the whole look and you look gorgeous in orange! Love the white textured skirt with the orange embroidery! Can’t wait to hear about your birthday weekend! Fab look, Merritt! Happy Birthday! What a fun and relaxing way to celebrate… Jealous! LOVE this look! That skirt is the best! Great top! Beautiful summer look. Happy early bday!! Enjoy your time this week =) Love how you pulled the look together with those orange mirrored sunnies. And you can never go wrong with Jack Rodgers! Love them in white!! LOVE this orange top and those sunnies are amazing! This color is amazing! You could style this top in so many different ways. Definitely need to invest in a pair of Jack Rogers too, they are the perfect everyday sandal. I can’t believe that top is from Old Navy – it’s so cute!! Loving the orange, it really is such a fun surprise! Great color! Love this outfit, the white and orange are perfect together. Love Jack rogers too. Also, have fun at the spa, I hear it’s one of the best. Also, I met Kelly once, when she was in Houston for her showcase. She’s nice. I also love how orange looks on you! have a great birthday pretty girrl! such a fun look. 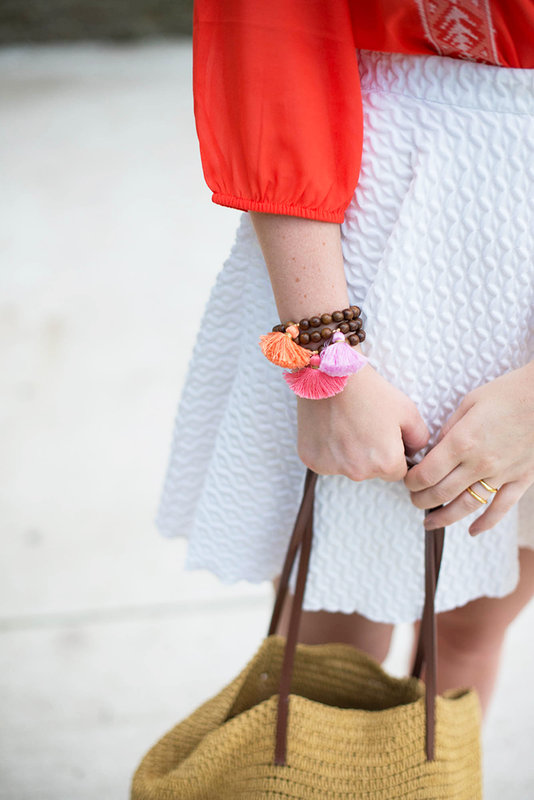 I love that skirt and those pops of orange. Happy early birthday to one of my fav and gorgeous blogger !! I adore this bright top!! I’m looking for stuff like this for our upcoming trip to Asia! I hope Kelly’s wedding was a blast — I have no doubt it was beautiful!